Pryce's Rahui Reserve is a bush remnant administered by the Royal Forest and Bird Protection society. The reserve was gifted by E O Pryce in 1941 and subsequently incorporated into Forest and Bird in 1961. Located on a fluvial terrace of the Rangitikei River, the reserve is dominated by kahikatea, with some rimu and matai emerging over a mixed broadleaf canopy. Walking guidebooks have noted the presence of a large matai in the reserve. 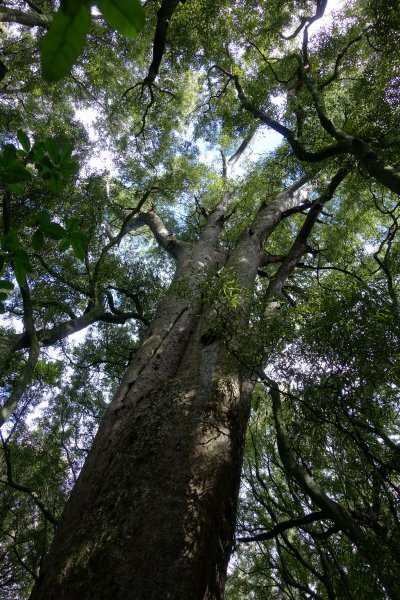 Located near the north-east border of the reserve, the matai is certainly an impressive specimen. There are a few other large specimens in the vicinity, but not with the same girth (Smillie, 2014). Straight shot up to a sparse upper branch. A short, squat trunk showing signs of fusion between the main leaders. The girth may be influenced by this low branching. 26 Apr 2014 Smillie, M.J.
Near the north-east corner of the reserve on the yellow loop track, in a relatively sparse grove of tawa. About 30 minutes walk in either direction from the entrance. The track can be somewhat indistinct underfoot.